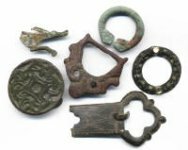 Gaukler Medieval Wares, Own Some History! Welcome Guest! Would you like to log yourself in? You can browse the store without logging in. Gaukler Medieval Wares makes jewellery and metalwork in ancient and medieval styles, using the methods and materials of the past. I do custom work, as long as the design is medieval or earlier. We also sell authentic ancient and medieval antiquities. All antiquities pictures have a white background, and all of my work has a black background.